Stamford Talk: Eat, Think, Drive, Blog! : Touch a Shark! I really like the Norwalk Aquarium, and this sounds like a great event. Visitor response was so positive to “Touch A Shark” in February that the special exhibit will return for an encore April 16-24 to The Maritime Aquarium at Norwalk. The special exhibit’s return corresponds to most area schools’ spring break week. 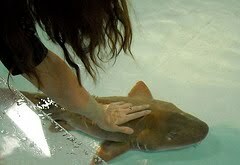 As similarly offered in February, “Touch A Shark” will feature live nurse sharks (Ginglymostoma cirratum), a comparatively docile species that tolerates having their backs gently touched by human fingers. Aquarium volunteers will be on-hand to make sure the shark-human interactions are safe for both parties. Interpretative graphics will provide details about nurse sharks and how they hunt and eat their prey, and also about how sharks sense their world. Plus, be sure to bring your camera to “Touch A Shark” for a shark dive-cage photo opportunity! A real diving cage, used for safe approaches to large sharks, will be positioned next to the Aquarium’s cast model of a 16-foot great white shark caught in the eastern end of Long Island Sound in the 1970s. Step inside the cage and pose to look like you’re having a real underwater encounter with the largest species of predatory shark – a species you don’t want to touch. “Touch A Shark” will be free with Maritime Aquarium general admission: $12.95 for adults, $11.95 for seniors and $9.95 for children 2-12. For more details, go online to www.maritimeaquarium.org or call (203) 852-0700. Oh great, they're coming back. I lost a finger in February thanks to one of those "docile" creatures. Now I know why they call them nurse sharks. It cost me a trip to Norwalk Hospital. Just kidding, I ♥ fish.